As the Earth's surface water evaporates, wind moves water in the air from the sea to the land, increasing the amount of freshwater on land. The water cycle, also known as the hydrologic cycle or the hydrological cycle, describes the continuous movement of water on, above and below the surface of the Earth. The mass of water on Earth remains fairly constant over time but the partitioning of the water into the major reservoirs of ice, fresh water, saline water and atmospheric water is variable depending on a wide range of climatic variables. The water moves from one reservoir to another, such as from river to ocean, or from the ocean to the atmosphere, by the physical processes of evaporation, condensation, precipitation, infiltration, surface runoff, and subsurface flow. In doing so, the water goes through different forms: liquid, solid (ice) and vapor. 2, hence is less dense. Due to the significant difference in density, buoyancy drives humid air higher. As altitude increases, air pressure decreases and the temperature drops (see Gas laws). The lower temperature causes water vapor to condense into tiny liquid water droplets which are heavier than the air, and fall unless supported by an updraft. A huge concentration of these droplets over a large space up in the atmosphere become visible as cloud. Some condensation is near ground level, and called fog. Condensed water vapor that falls to the Earth's surface. Most precipitation occurs as rain, but also includes snow, hail, fog drip, graupel, and sleet. Approximately 505,000 km3 (121,000 cu mi) of water falls as precipitation each year, 398,000 km3 (95,000 cu mi) of it over the oceans. [better source needed] The rain on land contains 107,000 km3 (26,000 cu mi) of water per year and a snowing only 1,000 km3 (240 cu mi). 78% of global precipitation occurs over the ocean. The precipitation that is intercepted by plant foliage eventually evaporates back to the atmosphere rather than falling to the ground. The variety of ways by which water moves across the land. This includes both surface runoff and channel runoff. As it flows, the water may seep into the ground, evaporate into the air, become stored in lakes or reservoirs, or be extracted for agricultural or other human uses. The flow of water from the ground surface into the ground. Once infiltrated, the water becomes soil moisture or groundwater. A recent global study using water stable isotopes, however, shows that not all soil moisture is equally available for groundwater recharge or for plant transpiration. The flow of water underground, in the vadose zone and aquifers. Subsurface water may return to the surface (e.g. as a spring or by being pumped) or eventually seep into the oceans. Water returns to the land surface at lower elevation than where it infiltrated, under the force of gravity or gravity induced pressures. Groundwater tends to move slowly and is replenished slowly, so it can remain in aquifers for thousands of years. The transformation of water from liquid to gas phases as it moves from the ground or bodies of water into the overlying atmosphere. The source of energy for evaporation is primarily solar radiation. Evaporation often implicitly includes transpiration from plants, though together they are specifically referred to as evapotranspiration. Total annual evapotranspiration amounts to approximately 505,000 km3 (121,000 cu mi) of water, 434,000 km3 (104,000 cu mi) of which evaporates from the oceans. 86% of global evaporation occurs over the ocean. The state change directly from solid water (snow or ice) to water vapor by passing the liquid state. This refers to changing of water vapor directly to ice. The movement of water through the atmosphere. 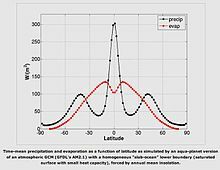 Without advection, water that evaporated over the oceans could not precipitate over land. The release of water vapor from plants and soil into the air. The water cycle involves many of these processes. The residence time of a reservoir within the hydrologic cycle is the average time a water molecule will spend in that reservoir (see adjacent table). It is a measure of the average age of the water in that reservoir. Groundwater can spend over 10,000 years beneath Earth's surface before leaving. Particularly old groundwater is called fossil water. Water stored in the soil remains there very briefly, because it is spread thinly across the Earth, and is readily lost by evaporation, transpiration, stream flow, or groundwater recharge. After evaporating, the residence time in the atmosphere is about 9 days before condensing and falling to the Earth as precipitation. The major ice sheets – Antarctica and Greenland – store ice for very long periods. Ice from Antarctica has been reliably dated to 800,000 years before present, though the average residence time is shorter. An alternative method to estimate residence times, which is gaining in popularity for dating groundwater, is the use of isotopic techniques. This is done in the subfield of isotope hydrology. The water cycle describes the processes that drive the movement of water throughout the hydrosphere. However, much more water is "in storage" for long periods of time than is actually moving through the cycle. The storehouses for the vast majority of all water on Earth are the oceans. It is estimated that of the 332,500,000 mi3 (1,386,000,000 km3) of the world's water supply, about 321,000,000 mi3 (1,338,000,000 km3) is stored in oceans, or about 97%. It is also estimated that the oceans supply about 90% of the evaporated water that goes into the water cycle. During colder climatic periods, more ice caps and glaciers form, and enough of the global water supply accumulates as ice to lessen the amounts in other parts of the water cycle. The reverse is true during warm periods. During the last ice age, glaciers covered almost one-third of Earth's land mass with the result being that the oceans were about 122 m (400 ft) lower than today. During the last global "warm spell," about 125,000 years ago, the seas were about 5.5 m (18 ft) higher than they are now. About three million years ago the oceans could have been up to 50 m (165 ft) higher. An instrument carried by the SAC-D satellite Aquarius, launched in June, 2011, measured global sea surface salinity. The water cycle is powered from solar energy. 86% of the global evaporation occurs from the oceans, reducing their temperature by evaporative cooling. Without the cooling, the effect of evaporation on the greenhouse effect would lead to a much higher surface temperature of 67 °C (153 °F), and a warmer planet. Aquifer drawdown or overdrafting and the pumping of fossil water increases the total amount of water in the hydrosphere, and has been postulated to be a contributor to sea-level rise. The hydrodynamic wind within the upper portion of a planet's atmosphere allows light chemical elements such as Hydrogen to move up to the exobase, the lower limit of the exosphere, where the gases can then reach escape velocity, entering outer space without impacting other particles of gas. This type of gas loss from a planet into space is known as planetary wind. Planets with hot lower atmospheres could result in humid upper atmospheres that accelerate the loss of hydrogen. In ancient times, it was widely thought that the land mass floated on a body of water, and that most of the water in rivers has its origin under the earth. Examples of this belief can be found in the works of Homer (circa 800 BCE). In the ancient near east, Hebrew scholars observed that even though the rivers ran into the sea, the sea never became full. Some scholars conclude that the water cycle was described completely during this time in this passage: "The wind goeth toward the south, and turneth about unto the north; it whirleth about continually, and the wind returneth again according to its circuits. All the rivers run into the sea, yet the sea is not full; unto the place from whence the rivers come, thither they return again" (, KJV). Scholars are not in agreement as to the date of Ecclesiastes, though most scholars point to a date during the time of King Solomon, son of David and Bathsheba, "three thousand years ago, there is some agreement that the time period is 962–922 BCE. Furthermore, it was also observed that when the clouds were full, they emptied rain on the earth (). In addition, during 793–740 BCE a Hebrew prophet, Amos, stated that water comes from the sea and is poured out on the earth (, ). In the Biblical Book of Job, dated between 7th and 2nd centuries BCE, there is a description of precipitation in the hydrologic cycle, "For he maketh small the drops of water: they pour down rain according to the vapour thereof; Which the clouds do drop and distil upon man abundantly" (, KJV). In the Adityahridayam (a devotional hymn to the Sun God) of Ramayana, a Hindu epic dated to the 4th century BCE, it is mentioned in the 22nd verse that the Sun heats up water and sends it down as rain. By roughly 500 BCE, Greek scholars were speculating that much of the water in rivers can be attributed to rain. The origin of rain was also known by then. These scholars maintained the belief, however, that water rising up through the earth contributed a great deal to rivers. Examples of this thinking included Anaximander (570 BCE) (who also speculated about the evolution of land animals from fish) and Xenophanes of Colophon (530 BCE). Chinese scholars such as Chi Ni Tzu (320 BCE) and Lu Shih Ch'un Ch'iu (239 BCE) had similar thoughts. The idea that the water cycle is a closed cycle can be found in the works of Anaxagoras of Clazomenae (460 BCE) and Diogenes of Apollonia (460 BCE). Both Plato (390 BCE) and Aristotle (350 BCE) speculated about percolation as part of the water cycle. Up to the time of the Renaissance, it was thought that precipitation alone was insufficient to feed rivers, for a complete water cycle, and that underground water pushing upwards from the oceans were the main contributors to river water. Bartholomew of England held this view (1240 CE), as did Leonardo da Vinci (1500 CE) and Athanasius Kircher (1644 CE). The first published thinker to assert that rainfall alone was sufficient for the maintenance of rivers was Bernard Palissy (1580 CE), who is often credited as the "discoverer" of the modern theory of the water cycle. Palissy's theories were not tested scientifically until 1674, in a study commonly attributed to Pierre Perrault. Even then, these beliefs were not accepted in mainstream science until the early nineteenth century. ^ "precipitation | National Snow and Ice Data Center". nsidc.org. Archived from the original on 2018-01-16. Retrieved 2018-01-15. ^ "Estimated Flows of Water in the Global Water Cycle". www3.geosc.psu.edu. Archived from the original on 2017-11-07. Retrieved 2018-01-15. ^ a b "Salinity | Science Mission Directorate". science.nasa.gov. Archived from the original on 2018-01-15. Retrieved 2018-01-15. ^ "Hydrologic Cycle". Northwest River Forecast Center. NOAA. Archived from the original on 2006-04-27. Retrieved 2006-10-24. ^ Evaristo, Jaivime; Jasechko, Scott; McDonnell, Jeffrey J. (2015-09-03). "Global separation of plant transpiration from groundwater and streamflow". Nature. 525 (7567): 91–94. Bibcode:2015Natur.525...91E. doi:10.1038/nature14983. ISSN 0028-0836. PMID 26333467. ^ "evaporation | National Snow and Ice Data Center". nsidc.org. Archived from the original on 2018-01-16. Retrieved 2018-01-15. ^ "sublimation | National Snow and Ice Data Center". nsidc.org. Archived from the original on 2018-01-16. Retrieved 2018-01-15. ^ "advection | National Snow and Ice Data Center". nsidc.org. Archived from the original on 2018-01-16. Retrieved 2018-01-15. ^ "condensation | National Snow and Ice Data Center". nsidc.org. Archived from the original on 2018-01-16. Retrieved 2018-01-15. ^ "Chapter 8: Introduction to the Hydrosphere". 8(b) the Hydrologic Cycle. PhysicalGeography.net. Archived from the original on 2016-01-26. Retrieved 2006-10-24. ^ Jouzel, J.; Masson-Delmotte, V.; Cattani, O.; Dreyfus, G.; Falourd, S.; Hoffmann, G.; Minster, B.; Nouet, J.; Barnola, J. M. (2007-08-10). "Orbital and millennial Antarctic climate variability over the past 800,000 years" (PDF). Science. 317 (5839): 793–96. Bibcode:2007Sci...317..793J. doi:10.1126/science.1141038. ISSN 1095-9203. PMID 17615306. ^ a b "The Water Cycle summary". USGS Water Science School. Archived from the original on 2018-01-16. Retrieved 2018-01-15. ^ Alley, Richard; et al. (February 2007). "Climate Change 2007: The Physical Science Basis" (PDF). International Panel on Climate Change. Archived from the original (PDF) on February 3, 2007. ^ Vahid, Alavian; Qaddumi, Halla Maher; Dickson, Eric; Diez, Sylvia Michele; Danilenko, Alexander V.; Hirji, Rafik Fatehali; Puz, Gabrielle; Pizarro, Carolina; Jacobsen, Michael (November 1, 2009). "Water and climate change : understanding the risks and making climate-smart investment decisions". Washington, DC: World Bank. pp. 1–174. Archived from the original on 2017-07-06. ^ a b Gillis, Justin (April 26, 2012). "Study Indicates a Greater Threat of Extreme Weather". The New York Times. Archived from the original on 2012-04-26. Retrieved 2012-04-27. ^ Paul J. Durack; Susan E. Wijffels & Richard J. Matear (27 April 2012). "Ocean Salinities Reveal Strong Global Water Cycle Intensification During 1950 to 2000" (PDF). Science (Submitted manuscript). 336 (6080): 455–58. Bibcode:2012Sci...336..455D. doi:10.1126/science.1212222. PMID 22539717. ^ Vinas, Maria-Jose (June 6, 2013). "NASA's Aquarius Sees Salty Shifts". NASA. Archived from the original on 2017-05-16. Retrieved 2018-01-15. ^ "Retreat of Glaciers in Glacier National Park". www.usgs.gov. Archived from the original on 2018-01-04. Retrieved 2018-01-15. ^ "Water Cycle | Science Mission Directorate". science.nasa.gov. Archived from the original on 2018-01-15. Retrieved 2018-01-15. ^ "Rising sea levels attributed to global groundwater extraction". University of Utrecht. 2014-12-05. Archived from the original on May 11, 2011. Retrieved February 8, 2011. ^ "Biogeochemical Cycles". The Environmental Literacy Council. Archived from the original on 2015-04-30. Retrieved 2006-10-24. ^ "Phosphorus Cycle". The Environmental Literacy Council. Archived from the original on 2016-08-20. Retrieved 2018-01-15. ^ "Nitrogen and the Hydrologic Cycle". Extension Fact Sheet. Ohio State University. Archived from the original on 2006-09-01. Retrieved 2006-10-24. ^ "The Carbon Cycle". Earth Observatory. NASA. 2011-06-16. Archived from the original on 2006-09-28. Retrieved 2006-10-24. ^ Nick Strobel (June 12, 2010). "Planetary Science". Archived from the original on September 28, 2010. Retrieved September 28, 2010. ^ Rudolf Dvořák (2007). Extrasolar Planets. Wiley-VCH. pp. 139–40. ISBN 978-3-527-40671-5. Retrieved 2009-05-05. ^ a b c Morris, Henry M. (1988). Science and the Bible (Trinity Broadcasting Network ed.). Chicago, IL: Moody Press. p. 15. ^ a b Metzger, Bruce M.; Coogan, Michael D. (1993). The Oxford Companion to the Bible. New York, NY: Oxford University Press. p. 369. ISBN 978-0195046458. ^ Merrill, Eugene H.; Rooker, Mark F.; Grisanti, Michael A. (2011). The World and the Word. Nashville, TN: B&H Academic. p. 430. ISBN 9780805440317. ^ Kazlev, M.Alan. "Palaeos: History of Evolution and Paleontology in science, philosophy, religion, and popular culture : Pre 19th Century". Archived from the original on 2014-03-02. ^ James H. Lesher. "Xenophanes' Scepticism" (PDF). pp. 9–10. Archived from the original (PDF) on 2013-07-28. Retrieved 2014-02-26. ^ The Basis of Civilization – water Science?. International Association of Hydrological Science. 2004. ISBN 9781901502572 – via Google Books. 2 'Origins and History of Hydrology', Dijon, May, 9–11, 2001. Archived (PDF) from the original on 2014-10-11. Retrieved 2014-02-26. Anderson, J. G.; Wilmouth, D. M.; Smith, J. B.; Sayres, D. S. (2012). "UV Dosage Levels in Summer: Increased Risk of Ozone Loss from Convectively Injected Water Vapor". Science. 337 (6096): 835–9. Bibcode:2012Sci...337..835A. doi:10.1126/science.1222978. PMID 22837384. 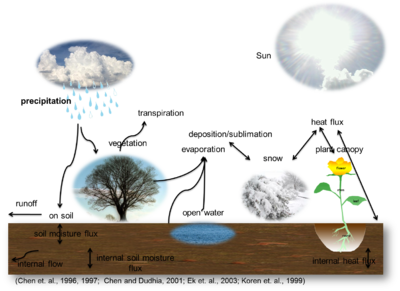 Wikimedia Commons has media related to Water cycle.